122 pages | 7 B/W Illus. This book explores how gentrification often reinforces traditional gender roles and spatial constructions during the process of reshaping the labour, housing, commercial and policy landscapes of the city. It focuses in particular on the impact of gentrification on women and racialized men, exploring how gentrification increases the cost of living, serves to narrow housing choices, make social reproduction more expensive, and limits the scope of the democratic process. This has resulted in the displacement of many of the phenomena once considered to be the emancipatory hallmarks of gentrification, such as gayborhoods. 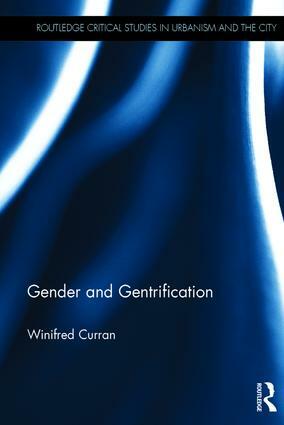 The book explores the role of gentrification in the larger social processes through which gender is continually reconstituted. In so doing, it makes clear that the negative effects of gentrification are far more wide-ranging than popularly understood, and makes recommendations for renewed activism and policy that places gender at its core. This is valuable reading for students, researchers, and activists interested in social and economic geography, city planning, gender studies, urban studies, sociology, and cultural studies. Winifred Curran is an Associate Professor at the Department of Geography, DePaul University, Chicago, IL, USA.